Sukyo Mahikari ("Sukyo" means universal principles and "Mahikari" means True Light) is an organization with centers in more than 100 countries. The organization aims to help people improve the quality of their lives and attain happiness by practicing universal principles and a method of spiritual purification called the art of True Light. It was founded by Kotama Okada in 1959 under the name L. H. Yokoshi no Tomo. Sukyo Mahikari was registered on 23 June 1978 by Keishu Okada as part of an amicable settlement following the passing of Kotama Okada. In 2013, Sukyo Mahikari announced it had a membership of approximately one million practitioners. 23 June 1978: The establishment of Sukyo Mahikari is announced by Keishu Okada, the adopted daughter of Kōtama Okada. 18 October 1984: Inauguration of the Inner Shrine (Okumiya) of the World Shrine near the summit of Mount Kurai. 3 November 1984: Inauguration of the World Shrine (Suza) in Takayama City. 23 June 1992: Inauguration of Hikaru Shinden, the shrine dedicated to the founder, Sukuinushisama. 5 May 2002: Inauguration of the Sukyo Mahikari Youth Centre. 3 November 2009: It is officially announced that the third spiritual leader will be Mr. Kōō Okada. The organization aims to promote peace and harmony in society through the practice of a method of spiritual purification and the practice of universal principles, such as gratitude, acceptance, and humility in all aspects of life. Sukyo Mahikari introduces a practice to purify one's spiritual aspect as an expedient toward attaining happiness. Radiating Light from the palm of the hand is a method of spiritual purification that cleanses the spirit, mind and body. It is said to help open the way to resolving all manner of problems. By purifying the spiritual aspect with the Light and leading a life based on principles of sustainability, people can revive their spirituality and attain increasing health, harmony and prosperity. The transmission of Light is referred to as "the art of True Light." Through the palm of the hand, a person (the giver) radiates Light to another person (the receiver), allowing them to purify and revitalize their spirit, mind and body. Radiating Light can be practiced by anyone who so desires, by attending the Sukyo Mahikari primary course. A session of Light typically begins with both the giver and receiver offering a short prayer. Next, the giver of Light recites a prayer that is believed to have a strong power to purify (the "Amatsu Norigoto Prayer"). The giver then holds his or her hand approximately 30 centimeters (12 inches) from the receiver's body. Sessions of Light usually last anywhere from 10 to 50 minutes. Sukyo Mahikari does not advocate the use of the art of True Light as a substitute for medical treatment or therapy. The founder of Mahikari, Mr. Kotama Okada, taught that the purpose of the art of True Light is not to heal disease or illness, but to be of service to society, bring happiness to people, and attain divine nature. The art of True Light is said to purify the spiritual realm of one's home and society, making them more peaceful and harmonious. Thus, members are encouraged to radiate the Light to anything, anywhere, and at anytime. Thus, the Light is not only radiated to human beings, but also to animals, food, buildings, and the natural environment. Sukyo Mahikari teaches the concept of universal principles that, when practiced together with the Light, allow one to more quickly attain spiritual and personal growth. Sukyo Mahikari encourages people to incorporate the divine principles in their daily life by practicing virtues such as altruistic love, gratitude, humility and acceptance of the will of God. Members also practice prayer, cultivating positive and cheerful attitudes, promoting harmony, charity and helping others, and being of service to God. Founder Kotama Okada believed that if people lived in accordance with the universal principles, they would cultivate their spirituality, and naturally come to use science and technology that was integrated with an understanding of spirituality, to find solutions to pressing issues facing humanity. Sukyo Mahikari promotes the practice of yoko agriculture. The practice of yoko agriculture involves organic agriculture combined with the use of positive words and attitudes to help people to cultivate respect for nature and restore soil to its pure and fertile condition. Accordingly, respect for nature and the natural environment is encouraged. The arbitrary use of chemical fertilizers, without consideration for the local environment, is discouraged. The organization has helped to create natural farms and promotes the distribution of natural and organic produce throughout the world. The headquarters of Sukyo Mahikari is located in Takayama City, Gifu Prefecture, Japan. Sukyo Mahikari has established regional headquarters in Australia-Oceania, Asia, Europe, Africa, Latin America, and North America, with centers located in over 100 countries. Within the United States and Canada, Sukyo Mahikari has 21 spiritual development centers. Sukyo Mahikari currently has approximately a million practitioners who form its membership. Becoming a member of Sukyo Mahikari does not require giving up any pre-existing beliefs or accepting Sukyo Mahikari as the only path or faith. Sukyo Mahikari teaches that the art of True Light and the universal principles transcend religious denominations and differences in ethnicity, nationality, and ideology. Sukyo Mahikari promotes cooperation and understanding between religious organizations toward establishing a sustainable and peaceful society. The emphasis the organization places on the spiritual unity of human beings has resulted in a membership that reflects a diversity of religions and nationalities. Sukyo Mahikari does not practice any form of tithe. The organization is sustained by the voluntary contributions (offerings) made by members. Rather than the amount, emphasis is placed on making offerings with sincerity. People are encouraged to make offerings that are voluntary and not beyond one's means. There are no mandatory contributions. However, there is a set amount for the appreciation offering to attend the introductory course and the spiritual cord maintenance offering. Members are encouraged to offer the monthly spiritual cord maintenance offering, which is approximately $7 in the U.S. and a similar amount in other regions. Cornille writes that there are a number of types of offerings in the organization: the spiritual cord maintenance offering; True Light appreciation offering; the special protection appreciation offering, and so on. In 1985 Keishu Okada established the Yoko Civilization Research Institute (YCRI). The objective of the forum is to find solutions to today’s problems by having leaders in different fields, regardless of their race, nationality, religion, and ideology, come together to share their acquired wisdom. 1st Yoko International Conference was held on Oct 30 to Nov 1, 1986. The theme was "Creating the future of mankind." 2nd Yoko International Conference was held on Oct 28 to Nov 1, 1989. The theme was "What does it mean to be human?" 3rd Yoko International Conference was held on Aug 18 to Aug 21, 1999. The theme was "Life and environment." 4th Yoko International Conference was held on September 18 to Sep 21, 2005. The theme was "Science and religion in the age of crisis." The 5th Yoko International Conference was supposed to be held on November 20–23, 2011. The theme was "Coexistence between nature and human beings: viewed through agriculture". It was cancelled due to the Great East Japan Earthquake. Sukyo Mahikari members have been involved in charity and social services around the world, such as in Côte d'Ivoire and Senegal (planting of trees and revival of national parks), in Angola (activities for children, elderly people, and beautify urban areas) and in both New York and Hawaii (for environmental cleanup activities). In 2000, Sukyo Mahikari co-sponsored the UN Millennium Summit of World Religious Leaders. 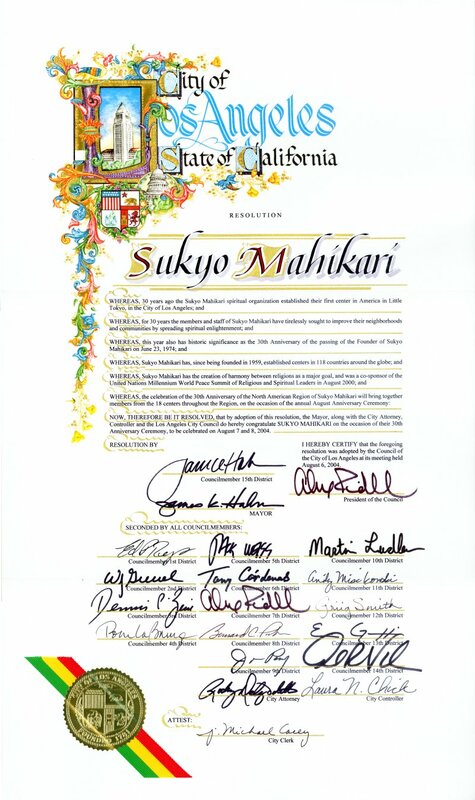 In August 2004, Los Angeles mayor James Hahn presented Sukyo Mahikari of North America with a proclamation commending the organization for its efforts in helping to create a peaceful and harmonious society; and in September 2009, Mayor Mufi Hannemann of Honolulu presented Sukyo Mahikari with a certificate declaring September 27 as Sukyo Mahikari Day in Honolulu in recognition of beach and park cleanup activities that the organization has conducted there over the past ten years. On May 6, 2010, the New York Center of Sukyo Mahikari was presented with a High Performance Building Plaque from The New York State Energy Research and Development Authority (NYSERDA) in pursuing a LEED (Leadership in Energy and Environmental Design) Silver rating from the U.S. Green Buildings Council. The plaque was given in recognition of energy-efficient measures incorporated into the new center that will help cut its energy costs by $8,400 per year and reduce its carbon footprint in New York City. In 2014, an award for excellence in reforestation activities was presented to Sukyo Mahikari by the President of Côte d'Ivoire. The award was in recognition of the reforestation activities of the Sukyo Mahikari youth members of Africa. At the presentation ceremony in Takayama, the award was presented on behalf of the president by Côte d'Ivoire's Minister for Environment, Water and Forests, Mr. Mathieu Babaud Darret. Since 2016, Sukyo Mahikari was granted special consultative status with the Economic and Social Council (ECOSOC) of the United Nations. Catherine Cornille writes in a research paper that the attrition rate is high. She also states "The emphasis on miracles and magic in Mahikari, on the other hand, accounts for the large turnover of members..."
In the 1995 and 1999 parliamentary reports, the organization was listed as having new-age tendencies, however, no conclusions were made regarding sectarian phenomena and as of 27 May 2005, the French government decided to stop periodically releasing a list of organizations associated with sectarian phenomena. ^ "Sukyo Mahikari, History2". Archived from the original on 2010-01-13. ^ a b "World Religions". Retrieved 2011-02-15. ^ a b "Adherents.com". Retrieved 2011-02-15. ^ a b "Sukyo Mahikari, About". Sukyo Mahikari North America. Retrieved 2009-09-10. ^ a b "Sukyo Mahikari, Light Energy". Sukyo Mahikari North America. Retrieved 2009-09-10. ^ a b c d e "Sukyo Mahikari, Universal Principles". Sukyo Mahikari North America. Retrieved 2009-09-10. ^ Tebecis, Andris (2004). Is the future in our hands? My experiences with Sukyo Mahikari. Canberra, Australia: Sunrise Press. p. 307. ISBN 0-9593677-4-8. ^ http://www.sukyomahikari.org/northamerica.html Retrieved 12 May 2013. ^ "Sukyo Mahikari, Partnerships". Retrieved 2009-09-10. ^ "Resolution by Councilmember 15th District, President of the Council, Mayor of Los Angeles, California". City of Los Angeles, California. 2004. Retrieved 26 August 2012. 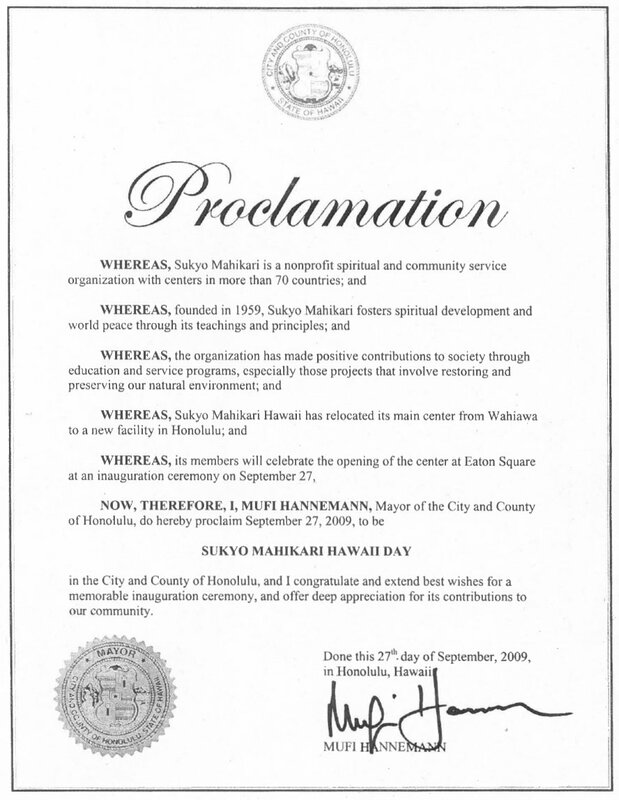 ^ "Proclamation by the Mayor of Honolulu, Hawaii". City and County of Honolulu, Hawaii. 2009. Retrieved 26 August 2012. ^ "NYSERDA Press Releases". NYSERDA. Retrieved 2010-07-21. ^ "Rapport fait au nom de la Commission d'enquête sur les sectes — Les sectes en France" (in French). Assemblée Nationale. 1995. Retrieved 25 November 2009. ^ "Rapport fait au nom de la Commission d'enquête sur les sectes – Les sectes et l'argent" (in French). Assemblée Nationale. 1999. Retrieved 25 November 2009. ^ "La fin des listes noires". Le Point (in French). 23 June 2005. Retrieved 25 November 2009. Chang, Sidney E., ed. (2007). God's Light and Universal Principles for All Humanity: An Introduction to Sukyo Mahikari. LH Europe. ISBN 2-9599717-0-1. Cornille, Catherine (1991). "The Phoenix Flies West: The Dynamics of the Inculturation of Mahikari in Western Europe" (pdf). Japanese Journal of Religious Studies. 18 (2–3): 265–285. Retrieved 2011-02-16. "Sukyo Mahikari North American Region Site" (webpage). pp. about. Retrieved 2009-09-10. Clarke, Peter Bernard (1994). Japanese New Religions in the West. Routledge. ISBN 1-873410-24-7. Davis, Winston (1982). Dojo: Magic and Exorcism in Modern Japan. Stanford University Press. ISBN 0-8047-1131-3. Hexham, Irving & Karla Poewe. New Religion...es., Boulderstview Press, 1997. Hurbon, Laennec. Mahikari in the Caribbean, Japanese Journal of Religious Studies, 18/2-3: 1991, 243–64. Knecht, Peter. Aspects of Shamanism: An Introduction, 2003. McFarland, Horace Neill (1967). The Rush Hour of the Gods: A Study of the New Religious Movements in Japan. Macmillan. ISBN 0-02-583200-X. McVeigh, Brian J (1992). "The Master Metaphor of Purity: The Symbolism of Power and Authority in Sūkyō Mahikari". Japanese Religions. 17 (2): 98–125. Murakami, Shigeyosu and Paul L. Swanson, Religion and Society in Modern Japan:.., Asian Humanities Press, 1991, 239–256. Weston, Erin Leigh (2002). "Transcultural Possessions in/of Mahikari: Religious Syncretism in Martinique" (pdf). Japanese Studies Review. 6 (1): 45–62. Retrieved 2007-09-23. Broder, Anne (2008). "Mahikari in context" (pdf). Japanese Journal of Religious Studies. 35 (2): 33–362. Retrieved 2010-08-04. Shibata, Kentaro (1993). Daiseishu, Great and Holy Master. L.H. Yoko Shuppan Co.Ltd. McVeigh, Brian J. (1997). Spirit, Selves and Subjectivity in a Japanese new Religion. Lewiston, NY: Mellen. ISBN 0-7734-8430-2. Tebecis, Andris K. (2004). Is the Future in Our Hands? My Experiences with Sukyo Mahikari. Canberra, Australia: Sunrise Press. ISBN 0-9593677-4-8. Yasaka, T (1999). "Hope for a Troubled Age". L H Yoko Publishers Tokyo.